I walked over to a nearby cafe to do just that. The day was getting hot but I needed a coffee. A bartender in Chicago once told me there’s nothing that can’t be figured out over a cup of coffee or a glass of whiskey. It was too early for the latter so I sat sipping at the acrid mass market brew, staring out at that strange ruin that wasn’t. It really did seem to have that ineffable power common to all ancient ruins and ex-girlfriends: the capacity to conjure a memory or a yearning for a time long past. Or, more often than not, a time that never was. Indeed, despite its uncanny correctness, this ruin was, in fact, neither of this time nor even of this place. Pyramid (Münster), is a Sol LeWitt “structure” created in 1987. Those mysterious memories being conjured? They’re anchored in the year that brought us Dirty Dancing and George Michael’s solo career. This lost piece of apocryphal archaeology belongs to the decade of the music video. Pyramid was originally installed in a botanical garden for the decennial exhibition Skulptur Projekte Münster. Münster, largely destroyed during World War II, seems like it must have been an especially appropriate home for LeWitt’s ambiguous piece. Does it represent construction or destruction? Is it a monument or a memorial? Strangely, despite these foreign origins, it struck me as the only piece in the exhibition that truly fits the city. This piece resonates with the Lower Manhattan in a way the others don’t. Maybe it was the same way in Münster. Maybe more so. Or perhaps this piece is attuned to some universal notion of city. Though I may have reveled in the romance of a lost metropolis, such a notion fell apart as soon as I saw the piece from the other side. What was once the corner of forgotten skyscraper becomes a quarter of a mini-Ziggurat. What was once a ruin becomes a tomb or ancient marker. Viewed in the round, the scale and evocations change with every step. In an exhibit named “Structures,” this seems to be one of very few pieces that deserves the name. The text accompanying the piece offers the limited explanation that these alternate perspectives “reveal the structure as a stepped pyramid or half-cube, suggesting the convergence of architecture and sculpture in Lewitt’s work.” But that doesn’t really mean anything. It reduces the work to seemingly little more than a didactic exercise. 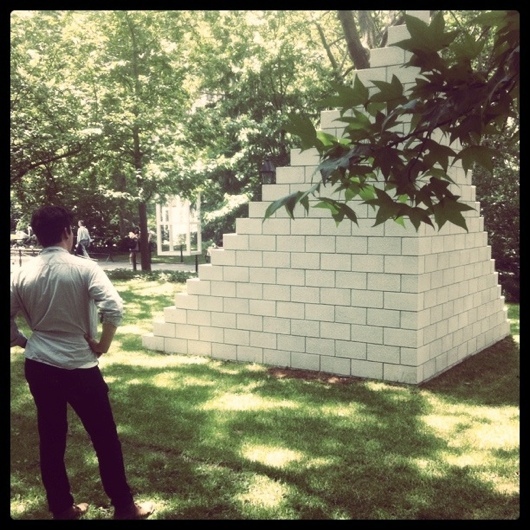 When, among the many structures of the outdoor exhibition, Pyramid (Münster) is one of very few pieces in the exhibition that is truly complemented by the brick and stone buildings surrounding New York’s City Hall Park. It opens itself to an urban reading that’s about more than seriality or materiality, or suggesting a connection between building and art. Even without knowing anything about architecture or history, Pyramid serves an a visceral reminder of the origin, and ultimate fate, of those surrounding buildings. Of every building in every city. It’s about about reality and time. It’s about what was, what is, what will be, and maybe even what could have been. Sol Lewitt: Structures, 1965-2006 is on view until December 2, 2011.